Are You The Now-Dead 556 HP Camaro Z28? 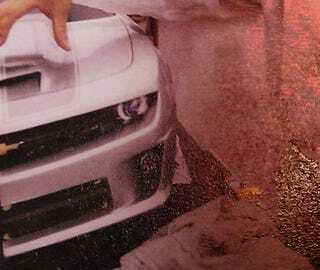 A very observant Camaro5 reader spied this single shot depicting an alternate future where 556 HP supercharged 6.2-liter LSA powered 2012 Camaro Z28s live and roam free upon the highways. This future didn't used to be so far off, but thanks mostly to the failing economy and subsequent carpocalypse we may never see this bow tie warrior compete with the monstrous 2010 Shelby GT500. The top dog Z28 model would have received a version of the 2009 Cadillac CTS-Vs 556-horsepower supercharged LSA, which in turn is a variant of the 638 horsepower 2009 Corvette ZR1 LS9. A larger power dome hood would have made room for the intercooler-topped small block while a larger functional hood scoop would have drawn in cold air to feed the monster. A revised front fascia with large intakes would have been used for functional cooling of both the engine and the massive Brembo front brakes.